Quite the transformation from Second Grace Vintage! Jeanine of Second Grace Vintage says, "This classic piece has been given a breath of new life. The mahogany stain was drab and boring so I decided to go outside of my chalk paint comfort zone and try something new...General Finishes Milk Paint. The color is called Driftwood and it's a gorgeous dark greige. 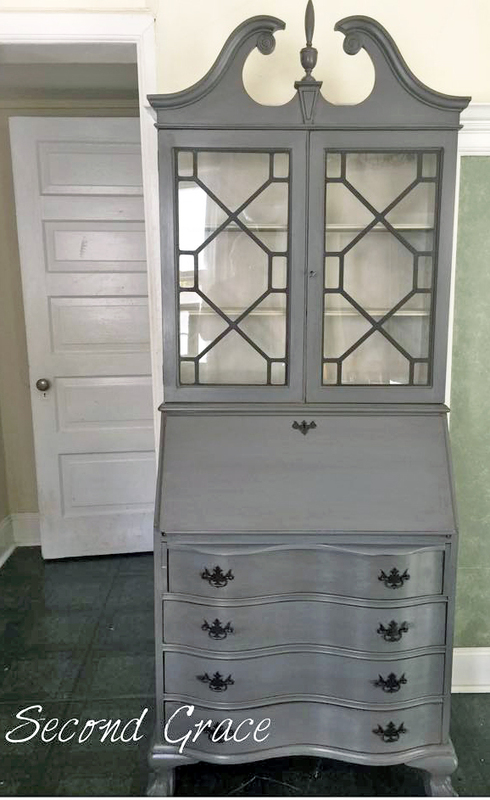 The inside is painted Antique White. I wanted this to look old and vintage so I glazed the entire piece with General Finishes VanDyke Brown glaze. The combination of the glaze and driftwood paint is simply stunning. The hardware is all original but was terribly tarnished. I decided to paint it with General Finishes Java gel stain and wow! It looks fabulous!"